Today, we're bringing you the best stocks to buy now, as broad market indexes like the Dow Jones Industrial Average (DJIA) and the S&P 500 continue to trade near historical highs. At the same time, though, some investors think the market's all-time highs could signal an upcoming correction. So, should investors buy into the stock market now? And what are the best stocks to buy now for investors looking to get in? Over the years, the stock market has proven to be the best investment class overall. Yes, stock markets go up and down, and sometimes there are bear markets (pullbacks of 20% or more). Nonetheless, over a 10-, 20-, or 30-year time span, the stock markets have historically provided U.S. investors with the greatest returns. Stocks have consistently beat the returns of bonds, real estate, and precious metals over these long time periods. Investors looking for the best stocks to buy today should pay close attention to earnings reports, particularly earnings per share (EPS) and price/earnings (P/E) ratio. EPS is the amount of earnings (profit) the company has divided by its outstanding shares. The P/E ratio is calculated by dividing the current share price by the most recent EPS report. An ideal portfolio first aims to find the best stocks for solid returns. But it should also protect an investor's wealth by having financially solid companies. The best stocks to buy are those tapped into expanding markets and those whose products will be needed year in and year out. The following stocks are Money Morning's best stocks to buy now. These companies are in either high-growth fields or have products the world cannot live without. They also offer investors solid growth potential, along with rock-solid financials. Money Morning Global Energy Strategist Dr. Kent Moors likes Magellan Midstream Partners LP (NYSE: MMP). It's a master limited partnership (MLP) – or a firm that makes 90% of its revenue from oil and typically operates in the midstream. In other words, it stores or transports oil instead of producing or selling. One of the biggest reasons we like Magellan is its strong presence in the $1 trillion "Permania" oil boom. That refers to the insane output growth happening right now in the Permian Basin, which stretches across New Mexico and Texas. The U.S. Geological Survey reported in 2016 there were as many as 20-billion barrels of oil in just one region of the Permian Basin. Since Magellan is one of the largest U.S. oil transporters, with 10,000 miles of pipelines, it could earn millions in revenue from Permania. Magellan is also adding roughly 1.7-million barrels of new oil capacity to its pipelines that stretch from the Permian to its Gulf Coast facilities. In other words, Magellan will be making a lot more money with newly expanded transportation capacity. The company already has a huge 36.4% profit margin, meaning 36.4% of Magellan's revenue becomes profit. As revenue increases from the Permian boom, the firm's big profit margin ensures profits will increase as well. MMP stock is down 7% to $70.35 in 2017, but we see this as a great opportunity to buy shares at a discount. The stock also offers a tremendous dividend yield of 5.06% – far above the average 1.9% yield of all S&P 500 stocks. One of the largest trends through 2020 and beyond is going to be the Internet of Things (IoT). The IoT refers to smart devices that can connect with each other and the Internet. Your tires may tell your car that they need replacing. Your refrigerator may send an order to the grocery store when you are out of milk. A company's computers will be told when it's time to replace equipment. All of these systems and devices will need chips to run the information. That means companies making chips will be major beneficiaries from the growth of this sector. SEMI, an industry group, estimates that the IoT semiconductor market will rise to $53.1 billion in 2020. That's a climb of more than 100% from last year's $27.6 billion. It is expected to more than double again by 2025, to $114.2 billion. The best stock to buy to profit from the IoT explosion is Qualcomm Inc. (Nasdaq: QCOM), which provides IoT chips for cars, homes, and bodies (in tech you can wear). It has the highest number of patents of any firm. QCOM trades at $51.80 per share, and Yahoo Finance projects its full-year EPS for 2018 to reach as high as $4.15. Given Qualcomm's price/earnings ratio of 19.84, its price target calculates to roughly $82.34 based on expected earnings. That would be a return of 59% from the current price. QCOM also offers investors an excellent dividend yield of 4.4%. Mitek Systems Inc. (Nasdaq: MITK) is our top profit play on the growing mobile transaction market. Mitek develops identity verification software and services that let users safely complete mobile banking transactions like insurance payments and check deposits. These include the Mobile Docs software, which is used for scanning financial documents, and Mobile Verify, which can be used for validating driver's licenses. The company's mobile transaction services put it at the center of an exploding industry, which is expected to grow up to 716% through 2021. According to Statista, total revenue for the tech companies making those transactions could be over $865 billion by 2021. Mitek's continued dominance will not only come from its mobile banking business, but also from its identity services. "The company is already the world leader in mobile capture and identity verification, so it has a huge first-mover advantage over its competition," Money Morning Small-Cap Specialist Sid Riggs said. "It's no surprise, then, that its top line nearly doubled over the last two years." Mitek's earnings have staged a massive turnaround in recent years. The firm has gone from a $5.3 million loss in 2014 to a $1.9 million profit in 2016. Mitek raked in income of $2.9 million – or $0.08 per share – in Q2 2017. That was up from $2.4 million – or $0.07 per share – in the same period in 2016. Freshwater is becoming increasingly scarce, and American Water Works Co. Inc. (NYSE: AWK) is a great way to tap into this profit opportunity. The United Nations reports there will be 40% less freshwater than we need by 2030. With the worldwide population expected to rise 29% to 9.7-billion people through 2050, this water shortage could transform into a global crisis. This water scarcity ties into two of Money Morning Chief Investment Strategist Keith Fitz-Gerald's six "Unstoppable Trends." The six trends are medicine, technology, demographics, scarcity/allocation, energy, and war, terrorism, and ugliness (also called "defense"). These trends are backed by trillions of dollars that Washington cannot derail, the Fed cannot meddle with, and Wall Street cannot hijack. AWK stock is a profit play on both demographics and scarcity/allocation since the global population is rising and freshwater supply is falling. The firm is the largest public water utility company in the United States, serving around 15-million people and providing wastewater maintenance. Keith has consistently recommended American Water Works over the last six years. Since first recommending it in December 2011, shares have surged 164%, to $82.34, through October 2017. Those returns will only keep growing thanks to the company's presence in a market with everlasting demand. Facebook is a tech titan and one of the best stocks to buy now. Robinson believes that its shares could appreciate to $250 per share by 2020 – far above its current price of $169. One of the reasons FB is a top pick is because its businesses are more diversified than its social media image and Facebook brand would suggest. It is steadily increasing revenue through its purchase of Instagram, which is the favorite social media site of young people. eMarketer, a research firm specializing in the space, estimates that Instagram will provide FB with a global advertising top line of as much as 10% next year. FB's other large play is in the virtual reality (VR) sector. Digi-Capital, another research company, forecasts that VR will be a $150 billion market in 2020. Facebook founder Mark Zuckerberg plans to move into spaces such as medical and education with VR. FB stock has climbed more than 681% in the last five years. Amazon.com Inc. (Nasdaq: AMZN) is one of the most dominant and expensive tech stocks on the market, with a current share price of $964. But if you want an inexpensive way to profit from Amazon's dominance, we recommend buying Digital Realty Trust Inc. (NYSE: DLR) at just $116 per share. Digital Realty owns and leases data centers to IT companies. These IT firms use the centers to store computer servers that manage data, cloud computing, and most importantly, video-streaming traffic. Cloud computing demand is projected to soar thanks to video-streaming traffic, which could increase by 300% over the next four years. Amazon's cloud business – Amazon Web Services (AWS) – controls 45% of the global cloud services market, and that dominance is expected to grow. As that happens, more IT firms in need of data centers will go to Digital Realty for space. Digital Realty and Amazon have also teamed up on a service called AWS Direct Connect. This lets Digital Realty's customers – typically IT firms – establish a direct, private connection between Digital Realty's data centers and AWS. This effectively reduces the customer's network costs. DLR stock offers a generous dividend yield of 3.19%. Shares of the company have climbed 26.6% over the last 12 months. Northrop Grumman Corp. (NYSE: NOC) is another one of our top defense picks to invest in for 2018. NOC is one of the best stocks to buy now because it is one of the top companies in a rapidly growing area of defense: C5ISR. "C5ISR" is an acronym. The "C5" stands for command, control, communications, computers, and cyber intelligence. The "S" stands for surveillance, and the "R" for reconnaissance. Essentially, that means they make drones, camera systems, and radar. And Northrop's overall business has been soaring in recent years. From 2015 to 2016, annual earnings increased 17.3%, from $10.39 per share to $12.19. Analysts expect that to climb 10.9% to $13.52 per share by the end of 2018. NOC is up 339.4% in the last five years and currently offers a 1.37% dividend. Finally, our top three stocks to buy now are among the most dominant companies in their respective fields. They've each posted returns as high as 97% during the first nine months of 2017, and we expect them to keep rallying next year. What Are Good Stocks to Buy Now? Investors looking for good stocks to buy now should focus on growing industries and industries that will always service a need. A big example is the Internet Software/Services sector, which companies like Alphabet Inc. (Nasdaq: GOOGL) and Facebook Inc. (Nasdaq: FB) help maintain and grow. Another sector to consider is defense stocks. This encompasses stocks like Lockheed Martin Corp. (NYSE: LMT) and Boeing Co. (NYSE: BA). How Do I Find the Best Stocks to Buy Now? 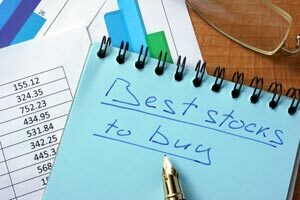 When looking for the best stocks to buy now, it's first important to find companies that have strong financial foundations. With a strong foundation, they won't be impacted by market sell-offs like momentum stocks are. It's also important to find companies that offer products and services that consumers cannot live without. These companies will also have stocks that can weather any type of market. What Sectors Should I Target When Looking for the Best Stocks to Buy Now? One of the best sectors when looking for the best stocks to buy is the technology sector. Every day, millions of people around the world log on to their smartphones, checking their social media pages, ordering food, and watching movies. Some of the best stocks in the tech industry that provide services we can't live without are Facebook Inc. (Nasdaq: FB), Apple Inc. (Nasdaq: AAPL), Amazon.com Inc. (Nasdaq: AMZN), and Netflix Inc. (Nasdaq: NFLX).